Synopsis: Lockwood & Co. might be the smallest (some might say shambollic) Psychic Detection Agency in London. But its three agents - Lockwood, Lucy and George - are exceptional Talents. And they get results. When an outbreak of ghostly phenomena grows to terrifying levels in Chelsea, Scotland Yard is left baffled. This was very much a shouting book for me...meaning I was shouting at the book to not do what I think was about to happen whilst I was sat on the overground...Yes that weird shouty man was me! I love that in a book, you want to be shouting, laughing even crying...and I did all the above (except the crying). Stroud has such fluid writing style that I just fall into, that kept a really good pace, there were some great tense moments, lots of build up and drama, which gave a lot of character development and overall made for a darn good story. We got to explore more into Lockwood's past...we had the introduction of Holly and the spanner that caused with Lucy, and whilst a lot of the Lucy Lockwood Holly triangle was a bit blatant, it still made for good, because I'm sooo sided with Lucy I was fighting with her. 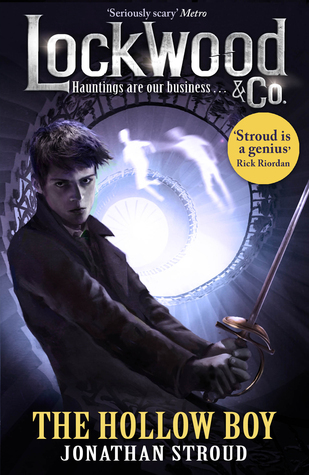 I think one of the great skills in this is how realistic the alternative London is, and this is something Stroud has always done will...in this and in the Bartameus cycle...you recognise places and names and it makes the book more of a tangible thing when reading. I'm very very much looking forward to the further adventures of Lookwood & Co something is and has been brewing over the last few books and when this will come to pass who knows but I can't wait to find out! The short and sweet is read this book, especially with Halloween coming up...I read it late at night and every creak freaked me out!